Few things symbolize summer at the lake like driving down a camp road. 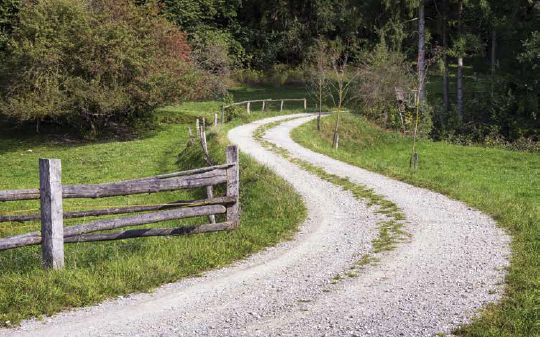 Many memories start with a turn off the pavement and down a tight, well-worn gravel track toward the pond. But these roads present major maintenance challenges and a poorly maintained road can cause drainage and runoff issues. “A camp road in poor shape is not only hazardous, but contributes to the decline of nearby surface waters and wetlands,” according to Maine Department of Environmental Protection’s Gravel Road Maintenance Manual, an essential booklet on the subject. Most camp roads date to the early 20th century, when builders of early camps and cottages would cut narrow swaths of trees 10-30 feet wide to establish a route. Though the roads have evolved some, most were built with little regard for runoff or a future with year-round camps. As a result, many of these well-traveled paths could use a little attention. A camp road in poor shape is not only hazardous, but contributes to the decline of nearby surface waters and wetlands. Properly maintaining a camp road isn’t always easy, but it is worth it. A road kept in good shape will save owners and users time and money in road and vehicle repair. Keeping a road updated facilitates year-round use and makes it easier for emergency services to access a camp. And a road in the best shape will reduce runoff to the lake and increase property values. Road Surfaces: The classic tire ruts are not good enough. Make sure your road is properly crowned and built up from drainage ditches and routes. Take a peek at your road materials. A well-built road should not just be “dirt,” it should be a mixture of gravel, sand and fine particles. And if you are using the road year-round, consider your snow removal plan. Culverts: Keep ‘em clear of dirt and debris! Build up entrances and exits with rocks and other materials to keep only water flowing through. Upgrade smaller, overflowing culverts. And replace crushed culverts. Ditches: The right size is key. You want the right width and pitch to service runoff. Keep an eye on the sides and embankments to see that they’re not eroding away. And remove debris when necessary.